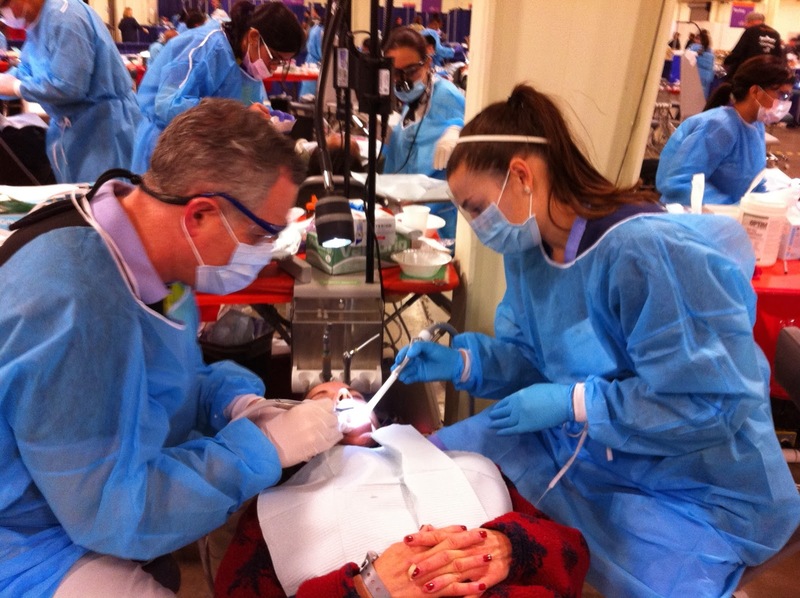 In December, I participated in a dental charity event run by the California Dental Association. As is often the case in these types of events, it was extremely rewarding. CDA Cares is a charity event put on by the California Dental Association. It was started a few years ago and is usually held twice a year, once in Northern California and once inSouthern California. During the event, dentists, hygienists, dental assistants, lab technicians, and other volunteers provide free dental care to those in need over a two day period. Over the years, I have been involved with other charity events but nothing as well organized and productive as this one. Obviously, as a dentist, I am aware of the tremendous unmet need for dental care and I was glad to have the opportunity to participate in this latest event. The event was held at the Del Mar Fairgrounds north of San Diego. Over 1,700 volunteers, including 900 dental professionals, were involved in CDA Cares and provided care for over 2,200 patients over a two-day period. It was divided into departments for oral surgery (the busiest section), fillings, preventive counseling, and a section for partials and dentures. I am not sure how people signed up for care but there was a long line of people lined up the night before the event was to begin. I helped out in the fillings and denture sections and also with Spanish translation. The patients came from very diverse backgrounds. That became apparent to me as soon as I arrived as they put out a call for a Somali translator (I don’t know if they ever found one). Although oral surgery was the busiest, I feel the need was greatest in the area of preventive counseling and oral hygiene as so much of dental disease is preventable. The energy of all the volunteers was fantastic and I met some great people. The people I was able to treat were all very grateful. They were mostly people who found themselves in unfortunate circumstances and unable to afford dentistry. We made a partial denture for a man who worked in sales and lost his front tooth, which made it impossible for him to get another job. We fixed two lower front teeth for a young lady who was unable to afford to fix them after breaking them during a grand mal epileptic seizure. It was a great event, with several large rooms filled with dentists and other providers all working on patients. Everybody had the same goal, which was to help as many people as possible and this was a wonderful experience. Like most dentists, I am aware there is a problem for many people in obtaining dental care. It can be costly and many in need are unable to afford it. I don’t really have the answers as dental education and training are so expensive and the costs of a dental practice are so high. But I know that events like CDA Cares can be a small part of the answer and I look forward to participating in future events.